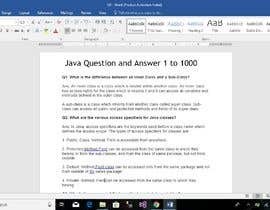 I want you to write me an MS word document with 1000 interview Java questions and answers, 1000 C language interview questions and answers, 1000 C++ programming interview questions and answers, 1000 SQL interview questions and answers, 1000 C#.Net interview questions and answers and 1000 Python interview questions and answers. Total 6000 interview questions and answers for the technologies given, 1000 questions each. The more of not copied content from web and the more of answers bring crisp and clear in explanations, the more chance to win the contest. How much minimum prize would be good for this requirement?